February already. What a long, strange trip its been in 2017. Each day I wake and… function. And feel such empathy for those who have to function in public, especially teachers, who have to shine and smile…but how? Those were the thoughts with which I greeted the second month of the Poetry Sisters’ annual Year in Poetry challenge. 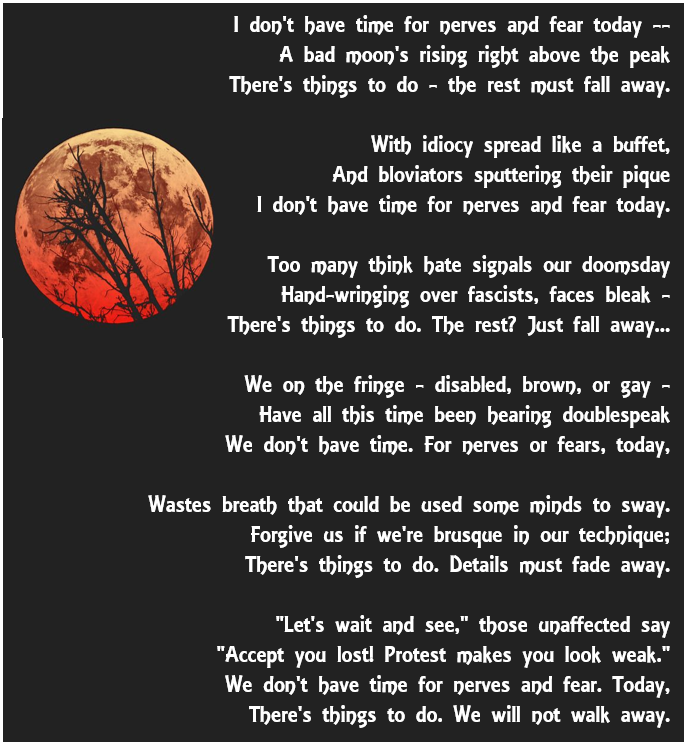 This month is Kelly’s choice, and she compelled us to write a villanelle on the subject of brevity/shortness. Now, we’ve revisited the villanelle repeatedly, and it’s actually one of my favorite forms. But, having finished a revision the penultimate week of January, I found myself floundering and the spatter of acidic ink on all of those “orders” – from Hater-in-Chief and the Confederate Cabinet – ate my creativity for lunch. This annoyed me. I am a child of the 80’s who wrote bad poetry all the time in response to the tyranny of shoulder pads. I could do this. The trick, it turned out, was volume, the same thing that worked in my tween years. I wrote TONS of awful villanelle, a form which easily lends itself to overstating a point. Sneer poetry? Is not nice. And I am so GOOD at it. I screeded, blaming everyone for everything. I showed no love at all. I recently started embroidering thistles, and they were enough to make me write about weeds, thorns, and bleeding (It’s a Glasgow thing. Nemo me impune lacessit, and all that. It worked for me. Don’t judge). Eventually, after many awful poems marinated in sarcasm and mean wit, I realized that my biggest fears about brief time these days were about myself… and what I feared I didn’t have time for anymore, and was wasting time doing, et voilà. A poem I could live with. And for more poetry from poets who wrote and write during daily drudgery as well as intense moments of antipathy, don’t miss Poetry Friday, which today is hosted by Penny Parker Klosterman at A Penny & Her Jots. The bad moon has risen, orange and malignant from the smoke in the air, as the garbage fire roars. Affix your breath mask and center yourself. You’ve got this. Go. I love seeing the thistles come back in a new form (after their appearance in #haikuforhealing)! In response to the “fringe” lines — YES. About time the rest of us experienced dis- mis- and/or non-representation. 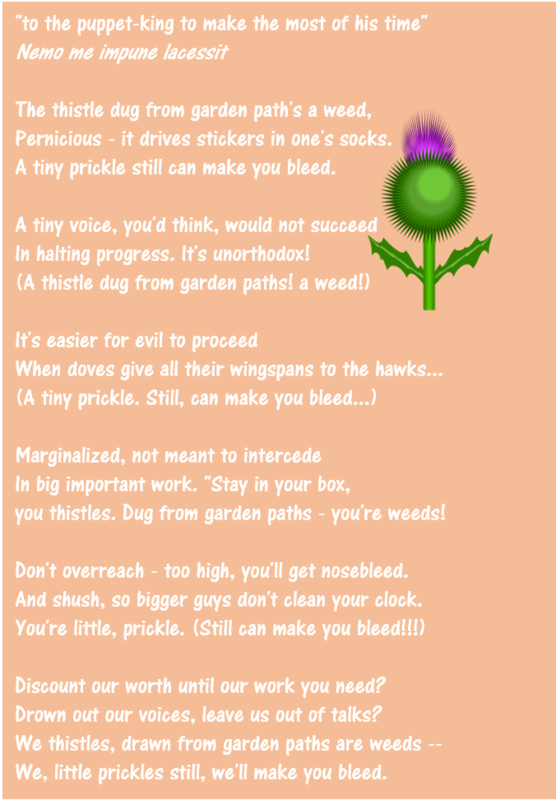 I adore the thistle poem, especially “when doves give all their wingspans to the hawks.” Here’s to the tiny prickle making the puppet king bleed. In the second poem, the tercet that begins “We on the fringe …” is my favorite. There is so much raw emotion in both of these poems. I, for one, am grateful you wrote so many poems and that you chose to share these two with us. Oh yes, thunderous applause on this end. Thank you for putting in words what I think every day but am too angry/frustrated to say. After multiple poems where I felt they were stilted, etc., I just decided to write a sentence and feel what I was feeling. I was going to try and write a poem about my anxiety and how it just sometimes stops me, but I was already impatient with myself — and that came out, and it just flowed from there. I’m glad it came across as jousting – I go round and round, trying to identify how I’m feeling, what the best use of my time is — I feel more like a rabbit in a maze than a jouster, but I will definitely go and be a burr under someone’s saddle! I would rather, use my privilege than lose it. It’s what I’ve been given, and often spending it only takes time or a quiet word, so why not. I definitely hear what you’re saying, though. GORGEOUS. I want to print out the “I don’t have time” poster. Thank you for these words and thoughts. Oh, my word. I just ADORE that you wrote about thistles. It’s such an anthem. I want to go out right now and pluck a thistle for my table, where it will remind me of you, and your determination to prickle… (Also, it makes me laugh, just a tiny bit, which is much needed.) Thank you, poetry sister. Thistle-friend. Thank you. yes yes yes yes yes…. thank you for writing this… it’s powerful….